2 basketball recruits in the class of 2020 who are expected to reclassify in 2019. They are twins and considered a packaged deal. They are down to Tulane, Pitt, and Rutgers, with them visiting presumed favorite Pitt this weekend. Justin is the higher rated of the two and is a borderline top 100 player in class of 2020. My question is if they intend to reclassify to 2019, does that essentially eliminate Tulane? Thanks for the heads-up but why could you not mention what positions they play? They are wings/small forwards. That we have. These guys are at Bishop Laughlin in NYC - right in Coach Chiles' sweet spot. Tulane not listed here, but who knows what's happening with other scholarship players after this train wreck of a season. Last night on the Coach's show, I was told that Coach Dunleavy stated we have 4 top-150 recruits in this weekend and in 1-2 years he expects us to be like Houston. Did anyone listen? Sounds like a guy who doesn't feel that his job his in doubt. 4 star, nationally ranked, borderline top 100 players? Na, Tulane doesn't need any of those. Looks like our 4-star 2020 commit, Elijah Wood, is one of the visitors this weekend. If you consider "Tulane shouldn't hope for any better than the cellar of the AAC" as a case for keeping a coach. He didn't say a good case, lol. When did Rick Dickson get a job writing fluff articles for ESPN? At this point, we are starting from rock bottom. All positions should be open and who is coming and going should all be known. This is no different than the first year under Perry Clark. How many games did that team win? Maybe I'm misreading it but the listing posted above had both as two stars. Thanks. So one service has them as four stars, one as three stars and one as two stars. Plus from what those that follow it closely tell us is that one is clearly better than the other so we have to use two slots up to get the one people really want. If the good one was five star I might see doing that but not based on these rankings. Yeah, but not their talent. Interesting little article that talks about a player on Kansas and how his ranking jumped 200 spots purely based on his commitment to Kansas and how the rankings are based on schools offering. Agbaji is an example of how a talented prospect can simply fall through the cracks by not playing into the recruiting services and AAU culture. There are not 300 better freshman basketball players in the country, and there weren’t 300 better high school seniors when he was doing this last year. Agbaji is also evidence of how much the scouting services are influenced by offers: In the two months after committing to Kansas, Agbaji’s 247Sports composite ranking (a compilation of main recruiting service rankings) jumped from No. 339 to No. 117 purely based on the fact that he chose Kansas. Bishop Laughlin played in New Orleans in the Allstate Sugar Bowl National Prep Classic in January. They won the tournament. I've been told Pitt's head coach and top assistant were there to watch them play. Here's a link to the video of the championship game, which was live streamed by Crescent City Sports. Teams from that tournament regularly attend Tulane MBB games during winter break. Obviously they are not hard to spot in a sparsely filled gym. Two or three years ago I spoke with the Loughlin coach (or perhaps it was another Catholic HS from Brooklyn or Queens) and his team walking back to the Loyola garage after an AAC game. Nice folks. They may have been staying at a Loyola dorm during winter break. The twins visited Pitt last weekend but are not committing there at this time; they may not commit anywhere til sometime next month after their hoops season ends. Pitt is still in the running for their services but they will take other visit(s). 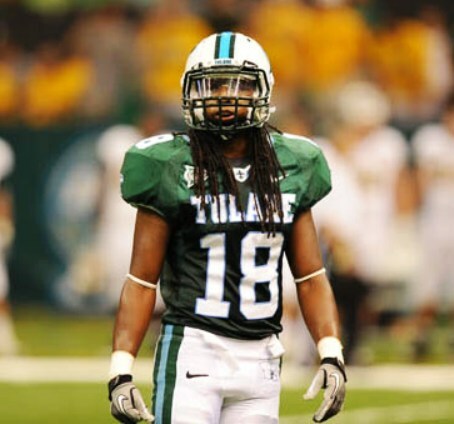 Not known if Tulane will get an official visit prior to signing day.